Click the above links for programme details. This residential course for University and College teachers was conducted by NIAS annually during the years 1993-1998, 2003, 2005, 2006 and 2008. 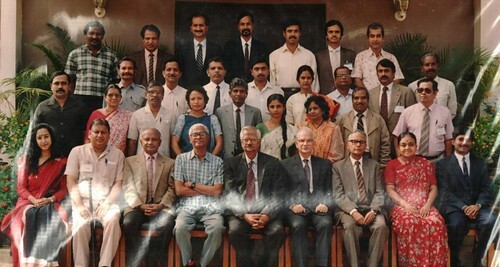 The university and college teachers of varied disciplines from all across the country participated in these courses which gave them an exposure to new advances in various fields of knowledge, and put them in touch with India’s socio-cultural roots and engaged them in discussions on major problems facing the country. This was done usually through lectures, panel discussions, debates, workshops, book reviews and educational tours. Eleven courses have been conducted with the broad theme of ‘Integrated Approach to Knowledge and Information’. NIAS conducts one week course annually for senior scientists and engineers who were identified by ISRO as potentially constituting its future leadership. The courses were conducted during 1999-2002 and 2004-2005 with the theme ‘The Indian Space Enterprise: Foreseeing the Future’, ‘The Indian Space Enterprise: Promoting Development in a Changing Economy’, ‘The Indian Space Enterprise: Challenges and Opportunities’, ‘The Indian Space Enterprise: Challenges and Opportunities’, ‘The Indian Space Enterprise: Technology for Sustainable Development’, ’The Indian Space Enterprise: Technology for National Development’ and ‘Indian Space Enterprise: Achieving Social Impact’. The main purpose of this course was to provide the orientation and planning skills as well as offer views of the broader scientific, economic, social and cultural milieu in which the Indian space programme should develop in the coming decades.